Ultra-popular comedian/acting titan/genius Bill Murray is one of Hollywood’s most unpredictable individuals. The icon, over the past few decades, has transitioned from manic comedic force to Wes Anderson dramedy anti-hero to grizzled veteran star. He is constantly shifting gears, starring in everything from Lost in Translation to The Monuments Men. 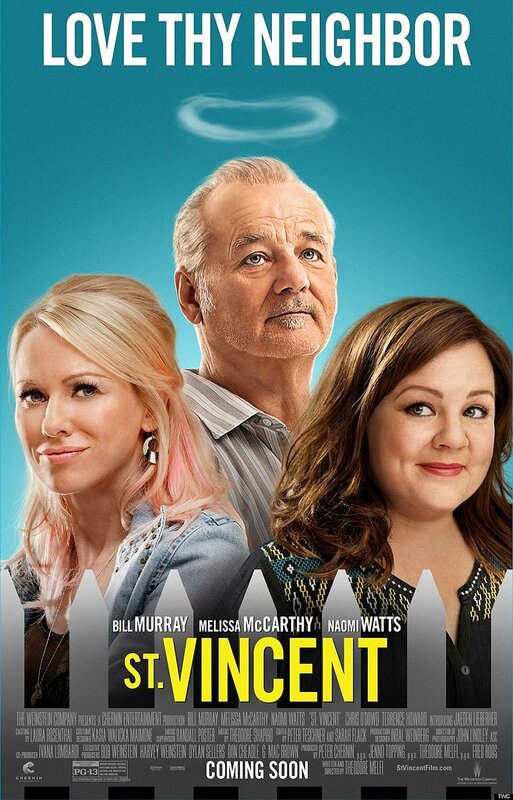 In his latest coming-into-age comedy, St. Vincent, Murray takes charge and carries it from beginning to end. Despite the severe flaws, it is difficult to not get excited whenever he on screen. Tapping into his party-crashing/off-the-wall statement persona, the comedian knows exactly what he’s doing here. Interestingly enough, Murray no longer has a manager or agent. Getting close to him is as tough as meeting the President or shaking the Pope’s hand. Indeed, St. Vincent is up for Oscar consideration thanks to the multi-talented and charming A-lister. However, this dramedy, despite his inherent charm, works best when surrounding him with other mega-star performers. Theodore Melfi’s feature debut gives the 63-year-old plenty to do…perhaps even too much. Vincent (Murray) is the very definition of curmudgeonly. The man has several major flaws alienating him from the rest of humanity. The Vietnam veteran chain-smokes and drinks whenever possible. Betting profusely on the greyhounds, his picks land him in debt with the local mob. They, represented by Zucko (Terence Howard), give him two weeks to pay up. The next day, his new neighbours – single mother Maggie Bronstein (Melissa McCarthy) and 12-year-old son Oliver (Jaeden Lieberher) – crash through his front garden and damage his fence, tree, and prized Chrysler Lebaron. For a $12 fee, Vincent agrees to babysit Oliver as to show him the ways of the world. Aided by pregnant stripper/prostitute Daka Paramova (Naomi Watts), our obnoxious ‘protagonist’ may just get better. Predictable yet charming events then ensue. From the get-go, St. Vincent lines up the chess pieces for everyone to follow without trouble. The first half is worth watching specifically for Murray and co.’s inherent charm and innate chemistry. The narrative – defined by several underdeveloped story lines and characters – relies on slapstick gags, kooky character moments, and surprising twists to get by. Conveniently, Vincent and Maggie form an uneasy truce for Oliver’s sake. The story – as Vincent teaches Oliver to defend himself, be realistic about the world, and live a quaint existence – specifically takes been-there-done-that turns. Hampered by the contrived set-up and happy-times montages, the first half keeps to a transparent emotional current. Awkwardly, the movie runs out of ideas and interesting content by the halfway point. The second half then takes several severe, irritating tonal shifts. Touching on Vincent’s life story, his physical health, and Dementia-addled wife, St. Vincent’s second-half tangents rift against everything else. The exhaustive number of sub-plots and character arcs severely dilutes the final product. The climax, pitting crisis against crisis, distorts the first two-thirds’ breezy pace. St. Vincent, despite its too-cute-to-be-dangerous vibe, bites off more thematic meat than it can chew. The movie, in its vague attempt to criticise modern America, sides with the lawbreakers and under-the-table dealmakers. Flaunting Vincent’s mean persona and questionable actions, its pro-rebellion/anti-establishment agenda talks down to, essentially, anyone with a job and/or family. In fact, it takes a violent left turn in criticizing Maggie’s worker-bee, post-divorce life. Melfi, despite his inexperience with feature-length story-telling, delivers a unique and refreshing visual palette. Distracting from the hodge-podge narrative, his style suits the eclectic material. Despite the excessive number of montages, these interludes themselves are welcome distraction peppered with flawless 1970/80s hit songs. Undoubtedly, Murray is this dramedy’s best asset. His impeccable comedic timing and range lend gravitas to his otherwise furstrating role. In addition, McCarthy and Watts, abandoning the norm, are enjoyable in minor roles. In his first project, Lieberher is rambunctious as Vincent’s open-minded guardian angel. Sadly, Howard’s out-of-touch performance might mark the end for the talented character-actor’s Hollywood career. St. Vincent, obsessed with its central saints and sinners, is too sarcastic to be serious but too sentimental to be gritty. Melfi and co., by throwing out several plot-threads and set pieces, could have delivered something substantial or even thought provoking. Despite my overwhelming qualms, I still liked it for being friendlier and more optimistic than most 2014 big-budget efforts. Sporting solid turns from its a-list cast, this movie proves less is more. Just don’t mistake simple for basic. Sadly, this happy-go-lucky performance piece fails to add up to the sum of its parts.